SPL SOLID Subframe Bushings replace the stock mushy rubber bushings to eliminate free play of the subframe relative to the chassis. This prevents the subframe from “bouncing around” under drivetrain torque or suspension load, maintaining optimum suspension geometry and reducing wheel hop. SPL’s slide-in shim system allows you to quickly raise or lower the subframe to fine-tune the roll center/anti-squat behavior to your preference. Raising the subframe will compensate roll center for a lowered car at the expense of increasing anti-squat. Lowering the subframe will decrease anti-squat at the expense of roll center. 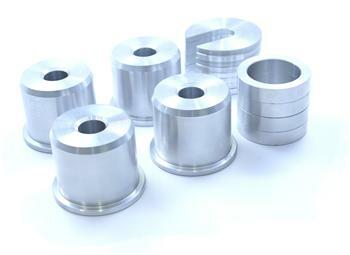 SPL SOLID Series Bushings are precision CNC machined from billet aluminum for an accurate fit. Kit also includes optional rubber isolation washers to reduce noise transfer from the subframe to the chassis.